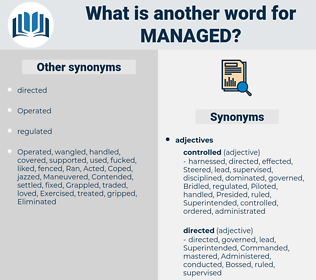 What is another word for Managed? arranged, engaged, manage-ment, manned, implemented, Emerged, maintained, guaranteed, Generated, treatment, addressed, Addressing, Garnered, organised, organized, utilization, assumed, Responded, charged, handled, Performed, demonstrated, determined, understood, Enabled, Existed, Undertook, Tackled, agreed, gathered, Dealt, Commanded, learned, Steered, transmitted, Remained, Achieved, identified, Gained, acquired, Caught, Began, Aimed, succeed, Succeeded, discovered, informed, Prevented, ensured, Delivered, established, pledged, Transpired, endeavoured, Wrote, attempted, conducted, instructed, programme, granted, checked, Enjoyed, edited, spearheaded, ended, Was, Were, AM, earned, prescribed, moved, insured, Contributed, contracted, Arrived, sent, spoke, Happened, capable, come, Came, use, used, leading, led, Obtained, assured, Presided, realized, ruled, Ourselves, intended, headed, concluded, secured, seized, commissioned, Convened, completed, permit, permitted, functioned, program, decided, direct, marked, Meant, Channeled, Became, grade, upgraded, Referred, Created, enlisted, Fought, landed, pointed, Attracted, Helped, derived, Served, Reached, licensed, failed, Proceeded, proved, graduated, wrought, Worked, decreased, qualified, produced, Deposited, Knocked, sought, occupied, battalion, trimmed, Told, broke, signed, Nailed, Brought, find, found, suceeded, licence, Yielded, From, Carried, set, drew, Met, Rode, levered, held, built, Resulted, laid, sponsored, Took, turned, forthwith, received, extended, reduced, Allowed, made, kept, heard, rose, processing, Gave, Provided, Passed, hosted, Slipped, saw, Scored, Chaired, placed, guys, Ran, us, possible, struck, bin, Knew, showed, Had, effected, won, Acted, Your, Caused, Looked, Awarded, Piloted, Went, figured, put, Pushed, tried, called, Got, busy, pulled, Did, 'd, 'il, cut, planned. arranged, engaged, Manipulated, governed, Negotiated, encouraged, Investigated, acknowledged, implemented, Emerged, leveraged, maintained, guaranteed, integrated, Generated, addressed, augmented, organised, organized, Examined, assumed, assessment, accomplished, Waged, Responded, charged, Overseen, handled, overcome, assigned, coordinated, co-ordinated, restrained, mastered, Performed, agenda, demonstrated, represented, cleaned, designated, safeguarded, incorporated, ascertained, Eliminated, sustained, executed, mandated, determined, evaluated, solved, understood, retained, Enabled, Undertaken, distributed, financed, animated, Assessed, strengthened, initiated, competence, resolved, Attributed, Tackled, enforced, dominated, agreed, disaggregated, formulated, Dealt, allocated, Activities, harnessed, accompanied, Transferred, reconfigured, attended, Learnt, Perpetrated, saved, Commanded, prepared, motivated, composed, removed, Reined, learned, Emanated, conceived, Legislated, Steered, Ceased, discharged, transmitted, Remained, combined, Achieved, employed, identified, restored, recognised, Delegated, Begun, Gained, acquired, preserved, entrusted, Caught, Translated, adjusted, Mobilized, presented, disposed, Aimed, finalized, succeed, Succeeded, cultivated, Averted, discovered, Explored, dismantled, informed, Persuaded, Prevented, embedded, defined, guided, recognized, ensured, Delivered, Compared, directorate, Indicated, Regarded, positioned, Progressed, established, written, collected, redirected, Constructed, Transpired, endeavoured, absorbed, adapted, protected, settled, attempted, spent, conducted, instructed, attained, programme, granted, Deployed, oriented, Survived, located, obliged, verified, subdued, Been, Rendered, Inspected, experienced, checked, Enjoyed, edited, approved, considered, designed, conquered, spearheaded, ended, Championed, earned, prescribed, moved, internet, inscribed, Encountered, constrained, insured, Comprised, spoken, converted, Contributed, contracted, Avoided, Arrived, Afforded, Culminated, Defrayed, sent, improved, Happened, Harvested, Remitted, come, faced, L, used, utilised, led, Obtained, contained, Prevailed, Earmarked, geared, Borne, assured, realized, Exercised, fixed, Issued, admitted, fed, shouldered, left, equipped, Tempted, ruled, restricted, Captured, satisfied, transposed, registered, intended, assisted, thrived, headed, concluded, fulfilled, framed, secured, Screened, seized, commissioned, Convened, Submitted, completed, stopped, landscaped, Injected, Introduced, supported, Deleted, permitted, committed, Channelled, functioned, Farmed, hired, revealed, filled, mentored, ordered, decided, situated, Forwarded, Promoted, exhausted, Followed, become, Meant, Meted, Fared, Procured, imposed, realised, Installed, split, groomed, Undergone, brokered, Appealed, Benefited, grown, upgraded, trained, practised, Referred, Created, affected, covered, Fought, Enshrined, advanced, recorded, shaped, pursued, Deceived, conditioned, care, Cared, Audited, Attracted, Helped, accrued, derived, Served, proven, adopted, Reached, licensed, failed, Prompted, proved, graduated, Worked, handed, qualified, Coached, Discussed, produced, released, Drafted, Flown, equal, finished, elaborated, Viewed, sought, broken, occupied, impact, Told, mounted, Upheld, noted, signed, Devolved, very, paid, tapped, included, Brought, Entered, dumped, Striven, found, Incurred, delayed, equality, Flanked, witnessed, chosen, drawn, Yielded, Offered, serviced, reviewed, Carried, vested, set, staffed, Exported, Returned, Met, loaded, levered, held, built, case, tested, taken, Approached, Resulted, laid, Logged, Adduced, sponsored, Launched, applied, bound, continued, turned, shot, received, added, divided, extended, risen, limited, given, played, reduced, Allowed, made, kept, crafted, planted, formed, heard, tied, Fitted, seen, Provided, attached, raised, Passed, blessed, hosted, Occurred, stored, Supplied, Scored, wheeled, Chaired, started, placed, posted, cultured, routed, Surveyed, Housed, known, fund, funded, struck, blown, Shown, have, fallen, Had, Debated, Accorded, listed, effected, Subjected, won, Acted, required, sorted, Caused, Looked, Awarded, Fished, Piloted, gone, driven, studied, figured, put, tried, Shifted, founded, Gotten, Got, based, done, planned. uneducated, free, undisciplined, wild, ungoverned, unsupervised. That can be managed, I think, if you will leave it to me.
" We managed," I said.